8 PAX gathered for a cruise on a perfect, clear 58 degree morning. YHC forgot his watch and had to pull a Landlord and run with his phone. I even flashed it at some oncoming cars. Needless to say, it didn’t make me as fast as him. 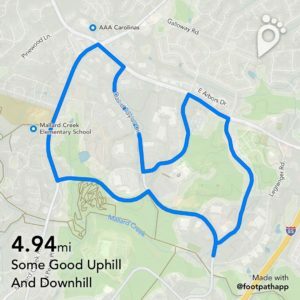 YHC planned a route to include a couple of good uphill runs up Governor Hunt and Claude Freeman; and some good downhill stretches down David Taylor and Senator Royall. We had quite a fast group and great effort was given by all. Many ran over 5 miles for the morning. Let me know what you thought of the route men. Maybe we’ll do it again? Thanks for letting me lead!